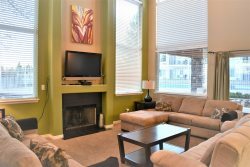 Four bedroom town home in Harbor Village. 2,500 square feet on three levels. Large driveway with parking for up to four vehicles. Parking Rules: Renters are allowed four vehicles on the property. Boats and trailers are not allowed. There is an overflow parking lot provided for boats and trailers. Parking permits will be issued by Bear Lake Lodging. Note: Free Wi-Fi is also available at the office.